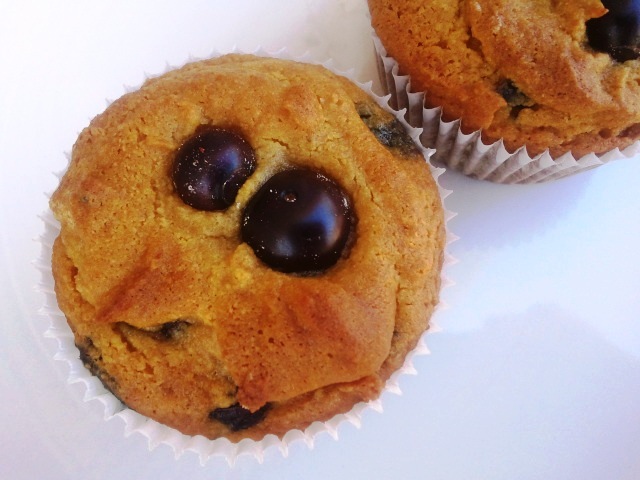 Ok, so since I have been gluten free, I have made recipe after recipe trying to make the perfect blueberry muffin! You see, growing up, I was obsessed with the boxed blueberry muffins. Now I am not saying these taste just like the boxed stuff, but in my opinion are much better. I prefer to use fresh berries, especially when they are in season. Please don’t give up on making these when you see that you have to whip egg whites. Those fluffy whites are the key to making these light and delicious. 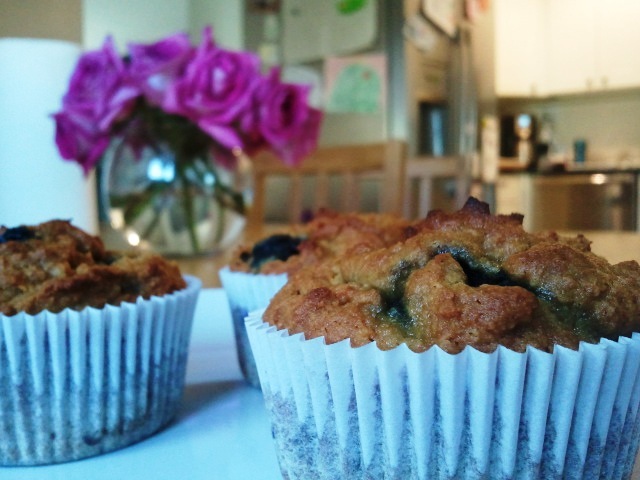 These gluten free, grain free, nut free blueberry muffins will surely please your taste buds. Whip eggs whites to stiff peak. In a separate bowl, whisk together butter, honey, yogurt and egg yolks. Add coconut flour and baking soda to butter mixture. Whisk to combine. Fold 1/3 of the eggwhites into the batter at a time, lightening it as you go. Coat the blueberries in the extra tablespoon of coconut flour in a small bowl. Add blueberries, gently folding in. Do not overmix. Immediately scoop into 12 lined or greased cupcake tins. I like topping each muffin with a few fresh blueberries before baking. Enjoy! This entry was posted in Gluten Free and tagged gluten free, grain free, scd. Bookmark the permalink. I would love to try this but wanted to make sure I put in the right amount of fat. Is “1/2 melted butter or coconut oil” 1/2 cup or 1/2 of something else? Could one substitute stevia for the honey??? these look marvelous! I didn’t try it with stevia yet, but they were a hit using honey! This week I will try a stevia blend and let you know how it turns out :) Love the recipes! I was really disappointed with these, they came out very eggy and very greasy. I’m sorry Tom, is it possible they weren’t baked long enough? Or perhaps the coconut flour was not firmly packed when measuring? Each oven works a little differently and they do take a bit of time to cook. These are so good!! The only ‘issue’ that came up was that they were crumbly. No one really considers that an issue other then the perfectionist in me, and I think I know what happened. I used frozen blueberries, and while they mixed in fantastically, they also froze or hardened the dough around them causing it to become crumbly. I think next time if I used frozen blueberries, I need to just let the dough sit for 15-20 minutes after I mix them – or unthaw the berries before I put them in! Thank you for another wonderful recipe! These are incredible. The house smells lovely and the kids have no idea they are gluten free!! Feeling pretty good! I’ve been cooking from this site daily:) I have these in the oven now, already smelling awesome! Except I am using native to Montana, huckleberries…we shall see!